Inspired Color. Defined Performance. 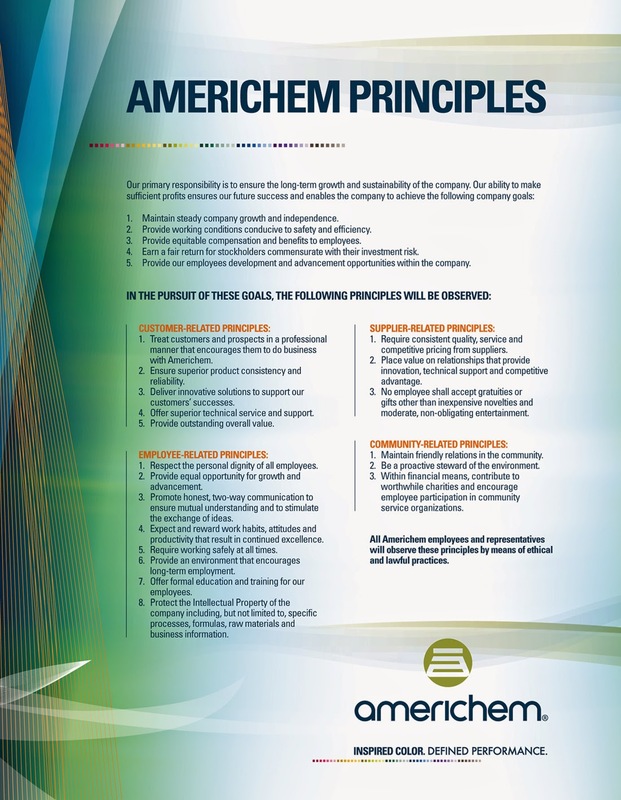 : The Four Unique Stakeholders of Americhem Inc.
At Americhem, we still hold true to some of the original principles that were instilled in us by our company’s founders. Over the years, these main beliefs have helped guide us in difficult times and in prosperity alike. Its part of what we believe as a company; that we have certain obligations to four groups of stakeholders that help keep us in business. Without the support of any one of these groups, we can’t survive or grow. So, straight from our official Americhem Principles, let’s take a look at all four groups. · Customers – We believe that our relationship with our customers should be a partnership, because when our customers are growing, Americhem grows too. We treat customers with respect and strive to solve their toughest challenges, whether or not those challenges are related to our products and services. We do our very best to provide our customers a superior product and a good overall value. · Employees – We want Americhem to be a place for the brightest and most talented employees, and a place where they can enjoy long-term employment. In fact, 39 of our employees have been with Americhem for 30 years or more, with our top tenured employee serving 45 years. That’s over seven percent of our workforce that has 30 years of service or more. We respect the dignity of all of our employees and promote two-way communication, emphasize safety and expect and reward excellence. · Suppliers – We also view our relationship with our suppliers as a partnership. Much like what our customers expect from us, we expect quality, service and value from our suppliers. We value our supplier relationships, because they often provide Americhem with innovation, technical support and competitive advantage. · Community – As a corporation, we practice good citizenship by maintaining friendly relations with our communities, environmental stewardship, and helpful giving and community service. We also encourage our employees to contribute and participate in community service. It’s all about giving back to those who have helped make us successful. Paying attention to these four vital groups has proven to be a successful formula for us over the years. As Jawaharlal Nehru, the first prime minister of India said, “Failure comes only when we forget our ideals and objectives and principles.” That’s why we remind ourselves frequently of their importance at Americhem.